Promoción de la salud y reducción de las vulnerabilidades: estrategia de producción de saberes y (trans)formación del trabajo en salud con base en la "Ergologia"
Translation from Interface - Comunicação, Saúde, Educação, Botucatu, v.14, n.32, p. 207-215, Mar. 2010. Keywords: Health promotion. Ergology. Healthcare training. O presente ensaio tem por objetivo refletir sobre a urgência de novas possibilidades no cenário da saúde a partir da proposta de conformação da "Comunidade Ampliada de Pesquisa em Promoção da Saúde". Esta estratégia visa contribuir para a formação do trabalhador da saúde articulando conceitos da Ergologia de Yves Schwartz e seu dispositivo dinâmico de três polos, com a perspectiva de percorrer caminhos originais de reflexão crítica e de requalificação do trabalho em saúde, propiciando a imersão do trabalhador no debate e experimentação do aprender a compartilhar e dialogar com saberes e práticas científicos e não-científicos, visando à promoção da saúde da comunidade. Desse modo, entende-se que essas experiências têm sua chance e suas exigências, tornando-se uma possibilidade de produção de saberes e (trans)formação do trabalho em saúde. Palavras-chave: Promoção da saúde. Ergologia. Formação em saúde. Palabras clave: Promoción de la salud. "Ergologia". Formación en salud. The present study aims at attempting to explore a new path related to healthcare work, as a result of the incorporation of knowledge and practices which came out throughout the 20th Century. It also aims to contribute to the reflection upon workers' training as social subjects able to contribute to the transformation of reality in Collective Health. Collective Health, knowledge field and social practice resulting from the sanitary movement which came out in Brazil in the 70's, was formed by the articulation of 4 axes - technical, ideological, political and economic practices - developed in the academic environment, in health organizations and within research institutions (Paim, 2006). It has been noticed that new conceptions have been incorporated in the scope of each axis, what has contributed to the reconfiguration of the knowledge and practices in the field. Although we believe that all the axes establish intersection relations among one another within the health production field, in this article we approach the ideological one, since we believe it exerts a not always clear but decisive influence on health production. As far as ideological movements are concerned, Paim (2006) claims that Collective Health has made use of dialog and criticism towards the movements known as Preventive Health Movement (Preventism), Social Medicine, Communitarian Health, Family Medicine and, currently, is dialoging with the so-called contemporaneous ideological movements, the Health Promotion Movement and the New Public Health Movement. The incorporation of concepts of these new ideological movements imposed in the past and still imposes today new knowledge on the field and, consequently, new practices with the purpose of transforming the individualistic look of the health field, reinforced by the biomedical paradigm, to more collective dimensions, with the aim of motivatingÂ sanitarian and social changes. In this sense, the New Public Health Movement - term that has been used since the meeting entitled Interregional Meeting on New Public Health, held in Geneva in 1995 -, proposed by hegemonic countries and supported by the WHO, defends the theory based on scientific premises of the biological, social and behavioral sciences, and establishes four basic tasks: prevention of non-infectious diseases, prevention of infectious diseases, health promotion, improvement of medical attention and rehabilitation. Among its concepts and strategies, the following ones were approached: health promotion and education, social marketing, communitarian participation, public health policies, which have been incorporated by the Brazilian Collective Health Movement (Castiel, Diaz, 2007; Paim, 2006). Although the New Collective Health Movement is a relatively recent proposal, many of the elements incorporated in its original documents had already been found in the health promotion movement which came out in the Alma-Ata Conference, held in 1978, which had, as one of its developments, the First International Conference on Health Promotion, held in 1986 in Canada, in which the Ottawa Charter for Health Promotion was published, an essential document to the propagation and diffusion of the concept of health promotion worldwide. Among the notions idealized by the Health Promotion Movement, we can point out the need of community training in order to improve its quality of life and health, whose general principle is the need to encourage reciprocal aid - each one taking care of him/herself, of the other, of the community and of the natural environment (Brasil, 2006). In a critical way, Castiel and Diaz (2007) emphasize that the promotional health breaks out the sphere of Medicine, physiology, epidemiology, which has a largely individualistic feature and is focused on the patient's body as the primary source and health object, in order to go through other paths, in which the moral and the good customs discourses rule. Moreover, the authors claim that the promotional health holds biopolitical conceptions of the somatic subjectivity that builds the body in its automanipulative malleability as an identity matrix. This conception of biopolitics, according to Ortega (2004), came out around the 60's as a project with a conservative characteristic considering the excesses of the time, as sexual promiscuity and the cult to drug use. Based on this conception, health was no longer 'life in the silence of the organs', idea so much disseminated by the biomedical model; it became the biopolitics of the societies to be built up in the light of a new moral, described by Sfez (1996) as the moral of the good eating (without cholesterol), of the drinking little (red wine to the arteries), of having single partner sexual practices (to avoid the danger of AIDS). In brief, it is related to the recovery of morality 'connecting it' back to the body. These new practices, while emphasizing the individual's care with his own health, contributed to the construction of bio-identities, i.e., the formation of an individual that is able of managing his/her self-control, self-watching and self-ruling (Ortega, 2004). In this sense, it is recognized that those new discourses are still not able to provide adequate understanding when facing the complex dynamics between the individual/collective health situation and the quick socio-cultural and subjective changes that are still limitedly intelligible (Castiel, Diaz, 2007). Based on these perceived limitations, other concepts and strategies started to emerge in the field of prevention practices and health promotion, being the concept of social vulnerability a concept/strategy of redirection of these actions towards more contextual and social dimensions. Thus, as Porto (2007) states, to recognize the social vulnerability while facing an injury or a disease is to understand the risks in a comprehensive and contextualized way. This bringing up, simultaneously, ethical, political and technical aspects that shape the distribution of risks in specific territories and the capacity of the populations to face them. Ayres (2001) also admits that the concept of vulnerability, arising from Law, is an attempt to move the normative horizons of health practices to an assumption of the ideal of disease control, respecting and promoting human rights. In other words, it is not the case of abolishing science from these systems, but of rescuing the dignity of other kinds of wisdom in the formation of useful truths to the construction of health, no matter whether they include academic or non-normologic knowledge, as philosophy, law and certain areas of the human science, and even various practical wisdoms transmitted secularly in the different cultural traditions. According to Munoz Sanches and Bertolozzi (2007), to interfere in situations of vulnerability, the development of actions that involve social answer is mandatory, as described by Ayres (1999) as the active participation of the population in search of solidary and possible to be executed strategies as well as of guidance/solution of health problems and needs. The application of the conceptual frame of vulnerability may provide elements which may vary from the development of actions, technological instruments to practices in the field of prevention and reduction of vulnerabilities (Ayres et al., 2003). Bringing the discussion to the context of health training, it is considered that the work in health should be rethought so that it can incorporate the concept of social vulnerability in the sense of rescuing other wisdoms, in addition to the scientific one, to the construction of health practices. However, for this (trans)formation to happen, we understand it is necessary that the individuals (in-training workers) are summoned to rethink their activities focused, up to now, on the biomedical, individualistic and normative model, considering other models that enable them to experiment, renormalize and transform their practices, so that they replace the normative impetus by the effort of establishing a dialog between the scientific and non-scientific wisdom. But how do we summon an individual to incorporate this new production of knowledge in health work? Based on this inquiry and understanding that the development of health professionals happens as from the experience in health work activity, we have the intention, with this paper, to discuss the theoretical and empirical possibilities that are open as we adopt the Ergology referential in the training of these workers. Ergology, subject of thinking inherent to human activities, which shapes the project of better knowing and, especially, better interfering in work situations in order to transform them, was started by Yves Schwartz and by his research team, in Aix-em-Provence, in France, in the 1980's, with the objective of being a subject directly related to work. It is a démarche which recognizes the activity as the debate of norms (Schwartz, Durrive, 2007). Ergology's proposal is to discuss the work and to produce knowledge about it taking into consideration: workers' knowledge and experience, general and specific aspects of the activity, its norms and variability, and the need of dialog among different subjects, in addition to constant questioning about its wisdoms (Hennington, 2008). To Schwartz (2000), Ergology is not, therefore, a 'subject' in the sense of 'a new knowledge domain'. It is a subject suitable for human activities and distinct from the epistemic subject that, to produce knowledge and concept in the 'experimental' science field, should, in contrast, neutralize the historical aspects. The ergologic démarche, even aiming to build rigorous concepts, should indicate in these concepts how and where the space of the partial (re)singularizations inherent to work activities is placed. Fígaro (2007) refers to Ergology as a theoretical-practical approach able to question the complexity of human activity and to distinguish the different factors that are pertinent to it. He also states that it proposes an epistemological posture which articulates the concepts of scientific subjects (abstracts, non-adherent) with the concepts of experience (of life, adherents), i.e., it proposes to get closer to this complex world comprised by man and his work activity. Here we understand health work as 'living activities' put into action by workers, subjects that, in a work situation, are able to invent and reinvent ways of doing that and also transforming themselves -themselves and the collectives (Santos-Filho, 2007). Work as activity, or better, human activity, automatically presupposes that the subject is summoned to work, since work is never done without the worker. This reflection is based on the assumption that those who deal with health work should recognize the health professional as the subject of his/her own knowledge and his/her own doing, and his/her work with an insertion and acting which takes him/her to the enlargement of his/her ability for analysis and for proposition in the collective extent, constituting themselves as teams, and exercising the rupture of stalled disciplinary wisdoms and going towards the transdisciplinary action (Santos-Filho, 2007). It is not possible to disconnect the set worker-work in the process of health production, for, according to Barros, Mori and Bastos (2007), when the workers are summoned in the work process, they ' make use of themselves', they use their potentialities, that is, they are managers of their own work and producers of wisdoms and novelties. The ergologic approach of Schwartz and Durrine (2007) assures that, when the worker is at work, he needs to make 'use of himself', he makes use of his own abilities, of his own resources and of his own choices to do the job, since every work situation is the place of a subjective 'drama', a destiny to be lived, where personal, historical circumstances are negotiated through the worker's 'body-self'. According to Schwartz and Durrine (2007), in order to mobilize the 'body-self' in a work situation, it is necessary to mobilize competences having in mind a common objective. The author points out, however, that to operate what would be the competencies of an activity in a work situation is a difficult task, taking into consideration that the work situations are imprecise, and never describable or standardizable. Nevertheless, the notion of competence is real and recognized when people who engaged in an operation answer positively and operate efficiently, considering this common objective. This way, three elements are noticed to be present in the notion of competence. They are: the appropriation of a certain number of previous norms, i.e., concepts which were transmitted and codified to situations and work; the presence of something completely different and new in relation to the previous norms of the work situation; and, finally, the exposition to the new, when people should rely on themselves to manage what is new, articulating a series of heterogeneous experiences, making choices in order to 'act in competence'. Ergology considers the set as interpellated: from one side, men and women, and from the other side, their histories, their environment, their way of life, in the heart of which is work (Schwartz, Durrine, 2007). According to Brito (2005), the angle from which Schwartz observes work is that which tends to be denied or even disregarded by the organizations. It is the angle of life, of the living work; of finding life in the process of work. Based on the ergologic perspective that there is the necessity of experimentation for the building of competencies to the management of work situations (Schwartz, Durrine, 2007); and, understanding that work in Collective Health is getting more and more complex and incorporating new concepts and practices (Hennington, 2008), it is a challenge, therefore, to renovate the health work activity through the means of the investment on new proposals and strategies that direct and insert the health workers into daily health practices and actions since the beginning of their training, in a less individualizing perspective and more contextual and collective one, considering that the 'living work' in health should place its emphasis on the promotion of health and the reduction of vulnerabilities. When reflecting upon the need to search for ways which could make these training professionals experience, in their daily lives, the practices of health promotion - reminding that taking care of health is part of each one's life -, it was necessary to search, in literature, an approach that could contribute to the training process of these professionals. In this way, we find, in Schwartz' Ergology and its proposal of the three-pole dynamic device, the methodology able to contribute to rethink the professional training enabling the dialog between scientific and non-scientific knowledge, that is, this methodology understands that health is not only the subject of health professionals, but also of those who live the experience of health conquest in an established historical social context, pervaded by ethical and epistemological presuppositions which aim common well being. The proposition of this device enlarged and deepened the concept of 'Enlarged Scientific Community' (ESC), developed by Ivar Oddone, a militant of the Italian Workman Movement, that, around the 70's, proposes a new conception of research, an original form of action research on the theme of changes of life and work conditions that articulated the workers' and researchers' wisdoms with the objective of knowing the real complexity of work. His proposal aimed at offering the workers and researchers a way of learning and using the accumulated experience in research centers and in work collectives so that one single, scientific experience would raise from these two types of experiences, which would give priority to the demands of professional categories, where all the agents would become co-authors of the research, and holders of specific wisdoms - exalting, thus, the workers' initiative to modify the work environment (Barros, Heckert, Marchiori, 2006; Schwartz, 2000). According to Souza and Bianco (2007), the main intention of the group was to contrast the researchers' formal wisdoms and the workers' wisdoms that are considered informal, emerging from it a new conception of research and, consequently, of knowledge production about work. In spite of the great contribution of this proposal, Schwartz (2000) reveals that ESC is limited, since it has proposed the primacy of the scientific field in the production of knowledge over activity, without clearly defining the competences related to each partner, Â and clarifying the joint work project. 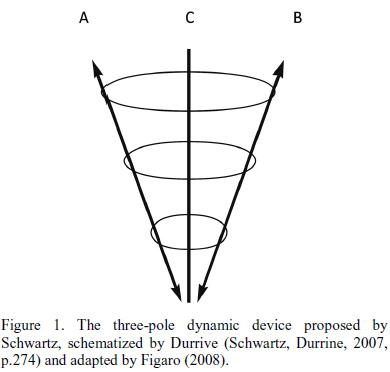 Schwartz, when resuming the concept of activity coming from ergonomics, as a human activity that is formed by partial renormalization of the means of life, proposes a three-pole dynamic device (3PDD) which aims at rescuing a pole to which was little valued in Oddone, Gastone and Gloria's (1986) proposal, the third pole. The pole that articulates a certain model of humanity, that makes the protagonist of the activity to look at his alike as someone that is in activity, that is, someone who is crossed by dramas (focus of debates, rules debates, resingularizing a situation) - as much as he is. The three-pole dynamic device is a type of dialectics which can be schematized in an spiral way, where wisdoms circulate, not only to know the previous rules of an activity, but also to understand the acts of recentering that operate in the activity (Schwartz, Durrine, 2007). It can be considered a means of action with a general philosophy, and, moreover, it Â can have a great diversity of application, such as: Trinquet (1996), who developed a device in a company with the objective of controlling the work risks; Durrive (2004), who used it in the training field, and Figaro (2008), who adapted the device proposed by Schwartz and schematized by Durrive in the communication field. The scheme developed by Luis Durrive from the three-pole dynamic device in the field of education was proposed in order to minimize the dichotomy found between the theory and practice present in professional training, in which it was perceived that the training students - that alternated between periods of training in school (theory) and periods in the working field (practice) - had, many times, learning difficulties because they were not able to manage the alternation between wisdoms built in the theory and the wisdoms resultant from practice. In this scheme, pole A represents the pole of wisdoms and constituted values in scientific universes, that is, the wisdoms that were built and are available to anticipate the activity. Pole B, represented by the wisdoms processed and re-processedÂ in the activity, consists of the pole where the learner and the people who work with him are: it is the meeting of several protagonists around what happens at work, not only to look at the work itself and the application of the constituted wisdoms available in pole A, as for looking at work as an unique moment, where the protagonists should be inventive to find solutions to the work. Finally, pole C, which constitutes the pole of questioning, is described as a Socratic axis1 having a double direction, where the meeting of different protagonists around what happens at work supposes a certain kind of demand that is, at the same time, a demand of learning, of mastering concepts and verbalization of work and, also, a demand of entrepreneuring learning (Schwartz, Durrive, 2007), described as a form of humbleness regarding the work activity that represents a source of information about the form with which one can put into practice the wisdoms constituted in pole B. The use of this scheme shows that, when meeting at work, one will never leave unhurt, since the three-pole dynamics engage all its protagonists. Understanding that there are multiple forms of representing the device, whose proposal is to put forward problems and produce knowledge about the human activity, even in a partial way (Fígaro, 2008), we point out the importance of using Ergology and the three-pole dynamic device as a methodological strategy in the field of health professional training. In the last two decades, much discussion and concepts have been introduced in the field of Collective Health; however, we notice that the application of these discourses have not been revealed in practice with the same speed that the theories have been presented, opening a gap between what is said and what is achieved. Changes in health practices are urgent; it is necessary that the hegemonic paradigm of the unilaterality in the relation of health worker (scientific knowledge)/ user (non-scientific knowledge) is broken by a model that places the individuals and their wisdoms as the main axis of attention in health practices. And, in this sense, we understand that the incorporation of the reflection proposed by Ergology and the three-pole dynamic device in the training process of health professionals can bring (trans)formations in health work. The challenge we pose is the one of building, in the training centers, a methodological device of training and research named 'Enlarged Research Community in Health Promotion and reduction of vulnerabilities' (ERC-HPRV)2, as a place for dialog-debate between scientific wisdoms and non-scientific ones deriving from the experience of health care of the training students; having, as principle, the 'mutual summoning', combining intellectual discomfort and epistemological humbleness, through meetings and dialogs that enable different individuals to speak, to listen, to feel, to ask, to reflect, to discuss and to recognize their own experiences and wisdoms and those of the other, besides proposing a healthier construction of life and work. Therefore, we hope that the training individual who participates in the ERC-HPRV (CAP-PSVR) process tries the dramas of the learning to think, learning to face and interfere collectively on behalf of the improvement of the general conditions of life and health, that is, to produce new norms in confrontation of the environment infidelities (Canguilhem, 1982). To conclude, this paper aimed at reflecting upon new possibilities that come out in the health scenario, able to contribute to break of the still hegemonic paradigm. In this perspective, we see, in the three-pole dynamic device, a favorable ground for reflection in the field of health professional training, since it intended to go through original ways of questioning and requalification of health work and to build, in an emancipating way, favorable practices towards the health promotion based on rules, wisdoms and renormalizations and experiences. However, paraphrasing Schwartz and Durrive (2007), obviously, we do not deceive ourselves about the difficulty in operationalizing such projects. But, as the author also states, we believe that these experiences have their own opportunity and demands, becoming a possibility for the wisdoms production and (trans)formation of health work. AYRES, J.R.C.M. Sujeito, intersubjetividade e práticas de saúde. Cienc. Saude Colet., v.1, n.6, p.63-72, 2001. ______. Vulnerabilidade e prevenção em tempos de aids. In: Barbosa, R.; Parker, R. (Orgs.). Sexualidade pelo avesso: direitos, identidades e poder. Rio de Janeiro: Relume Dumará, 1999. p.50-71. AYRES, J.R.C.M. et al. O conceito de vulnerabilidade e as práticas de saúde pública: perspectivas e desafios. In: CZERESNIA, D.; FREITAS, C.M. (Orgs.). Promoção da saúde: conceitos, reflexões, tendências. Rio de Janeiro: Fiocruz, 2003. p.117-39. BARROS, M.B. ; Mori, M.E. ; Bastos, S.S. O desafio da Humanização dos/nos processos de trabalho em saúde: o dispositivo "Programa de Formação em Saúde e Trabalho/PFS". In: Santos-Filho, S.B. ; Barros, M.B. (Orgs.). Trabalhador da saúde: muito prazer! Protagonismo dos trabalhadores na gestão do trabalho em saúde. Ijuí: Ed. Unijuí, 2007. p.99-121. BARROS, M.B. Trabalhar: usar de si - sair de si. Interface - Comunic., Saude, Educ., v.11, n.22, p.345-63, 2007. BARROS, M.E.B. ; HECKERT, A.L.C. ; MARCHIORI, F.M. Desafios para a pesquisa dos processos de trabalho: a CAP como estratégia. Est. Pesqui. Psicol., v.6, p.1-15, 2006. BRITO, J. Trabalho e saúde coletiva: o ponto de vista da atividade e das relações de gênero. Cienc. Saude Colet., v.10, n.4, p.879-90, 2005. CANGUILHEM, G. O normal e o patológico. Rio de Janeiro: Forense-Universitária, 1982. CASTIEL, L.D. Dédalos e os dédalos: identidade cultural, subjetividade e os riscos à saúde. In: CZERESNIA, D.; FREITAS, C.M. (Orgs.). Promoção da saúde: conceitos, reflexões, tendências. Rio de Janeiro: Fiocruz, 2003. p.79-96. CASTIEL, L.D. ; Diaz, C.A.D. A saúde persecutória: os limites da responsabilidade. Rio de Janeiro: Fiocruz, 2007. DURRIVE, L. Uma ação de formação no ambiente carcerário: um exemplo de abordagem das competências por meio da ergologia. In: DOLZ, J.; OLLAGNIER, E. (Orgs.). O enigma da competência em educação. Porto Alegre: Artmed, 2004. p.173-87. FIGARO, R. Atividade de comunicação e de trabalho. Trabalho, Educ. Saude, v.6, p.107-45, 2008. HENNINGTON, E.A. Gestão dos processos de trabalho e humanização em saúde: reflexões a partir da Ergologia. Rev. Saude Publica, v.42, n.3, p.555-61, 2008. MUNOZ SANCHEZ, A.I. ; BERTOLOZZI, M.R. Pode o conceito de vulnerabilidade apoiar a construção do conhecimento em Saúde Coletiva? Cienc. Saude Colet., v.12, n.2, p.319-24, 2007. ODDONE, I.; GASTONE, M.; GLORIA, S. Ambiente de trabalho: a luta dos trabalhadores pela saúde. São Paulo: Hucitec, 1986. ORTEGA, F.J.G. Biopolíticas da saúde: reflexões a partir de Michel Foucault, Agnes Heller e Hannah Arendt. Interface - Comunic., Saude, Educ., v.8, n.14, p.9-20, 2004. PAIM, J.S. Desafios para a Saúde Coletiva no século XXI. Salvador: EDFBA, 2006. PORTO , M.F.S. Uma ecologia política dos riscos: princípios para integrarmos o local e o global na promoção da saúde e da justiça ambiental. Rio de Janeiro: Fiocruz, 2007. SANTOS-FILHO, S.B. Um olhar sobre o trabalho em saúde nos marcos teórico-políticos da saúde do trabalhador e do HumanisaSUS. In: Santos-Filho, S.B. ; Barros, M.B. (Orgs.). Trabalhador da saúde: muito prazer! Protagonismo dos trabalhadores na gestão do trabalho em saúde. Ijuí: Ed. Unijuí, 2007. p.73-96. SCHWARTZ, Y. A comunidade científica ampliada e o regime de produção de saberes. Trabalho Educ., n.7, p.38-46, 2000. SCHWARTZ, Y.; DURRIVE, L. Trabalho e ergologia: conversas sobre a atividade humana. Niterói: EdUFF, 2007. SFEZ, L. A saúde perfeita: crítica de uma nova utopia. São Paulo: Unimarco-Loyola, 1996. SOUZA, E.M.; BIANCO, M.F. A Ergologia: uma alternativa analítica para os estudos do trabalho. In: CONGRESSO LATINOAMERICANO DE SOCIOLOGIA DEL TRABAJO, 5., 2007, Montevidéo. Anais... Montevidéo, 2007. p.1-13. Disponível em: <http://www. urosario.edu.co/RET/documentos/Ponenciaspdf/014.pdf>. Acesso em: 18 nov. 2009. TRINQUET, P. Maîtriser les risques du travail. Paris: PUF, 1996.
i Address: Av. Brasil, 4365 - Manguinhos, Rio de Janeiro CEP: 21040-360. 1 Socrates (469-399 a. C.) developed a philosophy through critical dialogs with his interlocutors.